Bronze sculptor Mic Carlson was born in Grand Rapids, Michigan in 1965. 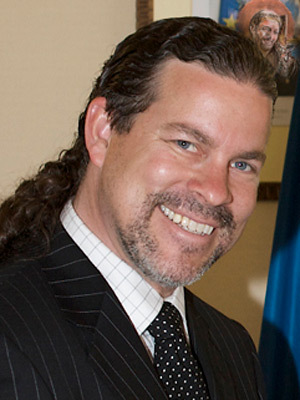 He has operated his own galleries in Grand Rapids and Saugatuck, Michigan. He has had 4 exhibitions in Italy, including a month long exhibition at the Basilica of San Francesco in Assisi, Italy. He displayed 16 bronze statues telling the story of St. Francis of Assisi. His wife Susan Evangelista has added a major spark in Mic's career, not only in her countless support but also documenting his creations and exhibitions on video for the best of 20 years. 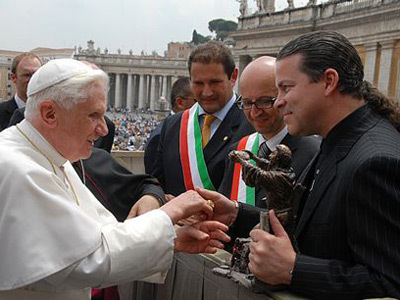 Mic also presented Pope Benedict a bronze sculpture of St. Francis at the Vatican in 2008. An 11 acre Saint Francis of Assisi sculpture garden for prayer and meditation in Grand Rapids is being built that will forever showcase the collection of 24 bronze sculptures by Mic. Mic continues to create large bronze monuments. His West Michigan bronze statues include a seven foot “Madonna of the Streets” located in the Garden of Life on Bridge Street, "Christ at the Pillar’” a seven foot bronze at Holy Redeemer in Jenison, "Living Cross”, a 13 foot bronze cross at Cascade Christian Church in Ada, Officer Robert Kozminski bronze located at Richmond Park. Early 2018, Mic will unveil his largest monument in front of the Basilica of St. Adalbert of "Jesus and the Children."